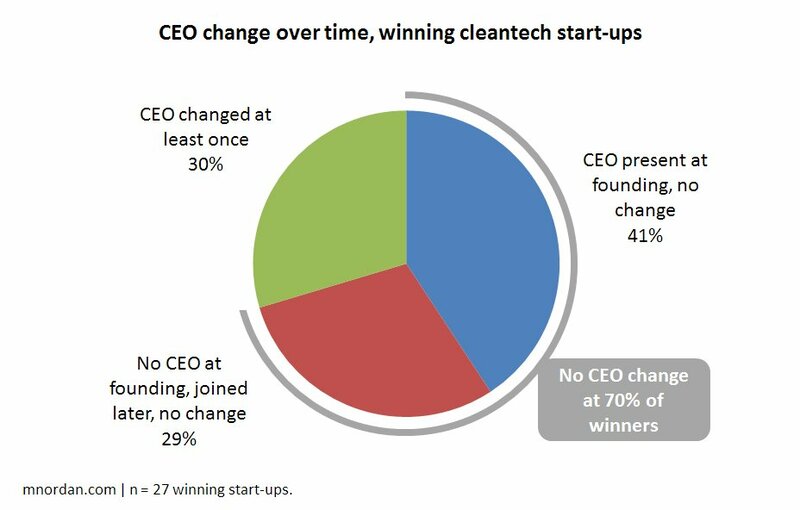 tl;dr: Winning cleantech start-up teams are complete at founding, have strong pre-existing relationships, and include the inventor of the core technology. This post was co-written with Josh Rogers, a former Venrock intern who’s now in National Grid’s Strategic Planning and Corporate Development group. 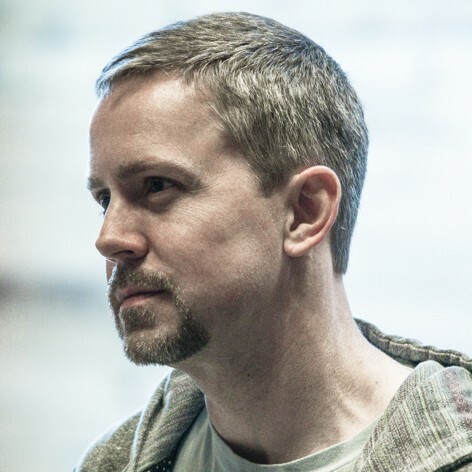 A version of it also appeared at GigaOM. 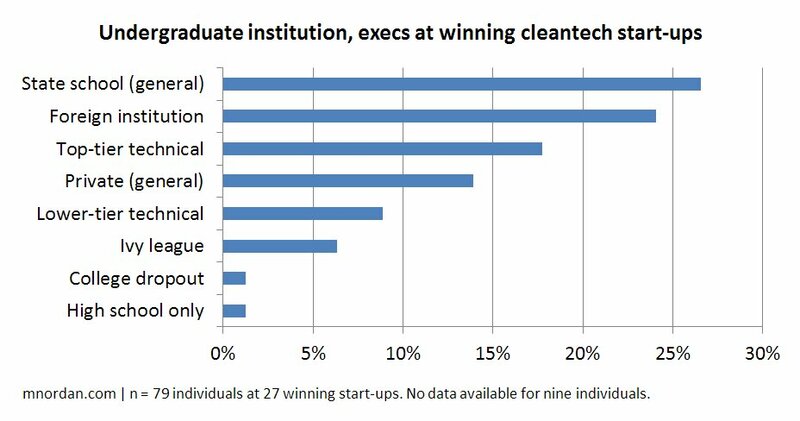 A year ago I published a post called “What It Takes to Build A Cleantech Winner” based on an analysis of 18 cleantech success stories – venture-backed start-ups that executed big IPOs. The conclusion was that it’s not the technology (the best one rarely wins) and it’s not the market (if the market’s already big and attractive, you’re probably too late); instead, it’s the team that determines success. That begs the question: What makes a great team? To answer this question, you’d need to do two things. 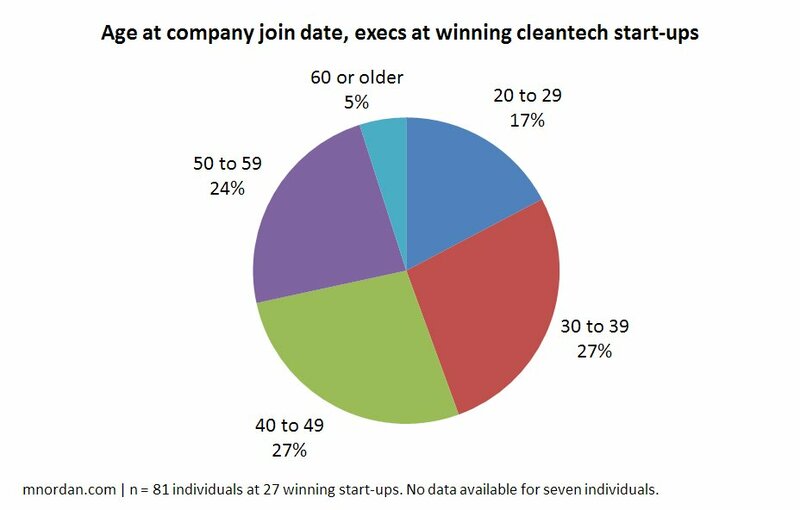 First, you’d need to analyze the personal histories of core team members at a slew of successful cleantech start-ups to figure out what they had in common. Second, you’d need to compare these people against their peers at unsuccessful companies in the same domains, to learn whether the winning teams differed from the losing ones. 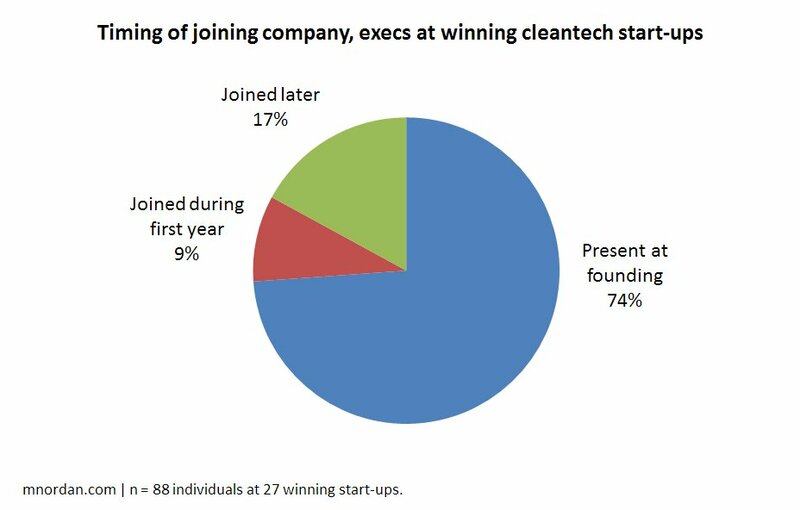 First, he established a set of 27 winners – VC-backed cleantech start-ups that had either gone public on a major exchange since 2000 or filed an outstanding S-1 at the time of the analysis, and for which we could build fine-grained histories of the executive team. Examples: Tesla, Color Kinetics, Silver Spring. Second, he assembled a set of matched-pair companies that were in the same industries as the winners and were founded at about the same time, but which unambiguously failed: They either went bankrupt or sold in a fire sale. We would have liked to have had a counterpart for every winner, but because so few companies have tanked completely instead of limping forward, we were limited to ten matches. Examples: Solyndra, GreenFuel, WebGen. Then he collected exhaustive data about the backgrounds of every key executive in each of these 37 businesses – 122 people total – including their age, education, country of origin, past work experience, and a host of other variables (39 altogether). When Josh began his work, we joked that maybe he’d crack a hidden code: Perhaps I’d hear “Well, Matthew, at all the winning start-ups the CEOs were in their 40s and joined from large companies, while the CTOs hailed from the following five universities.” If so, I could simply ignore all the other business plans I get and focus on the ones that matched the template. Hey, a man can dream, right? And so on. In fact, the only interesting correlation we found was that team members at winning companies tended to be industry outsiders: A mere 28% of them had direct work experience in their start-up’s industry. However, this attribute didn’t predict success because it was the same for our sample of failed companies too (where 26% of execs had prior direct work experience). 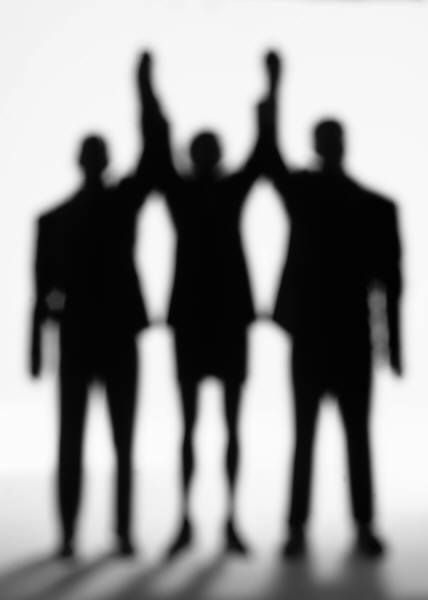 Winning teams were complete at company founding. Of the 88 key executives profiled in the 27 successful companies, 74% were present at founding and another 9% joined during the first year. Only one out of six joined after that. CEOs changed rarely. MBA orthodoxy holds that different stages of a company’s life require different leadership skills, so the CEO should be swapped out as companies develop. Our data didn’t support that. Eleven out of 27 successful companies had a CEO at founding who stayed through the IPO or S-1 filing; another eight were founded without a CEO, but recruited one (usually in the first year) who stayed for the long haul. Only eight winning companies changed CEOs, with only one clearly hostile transition (namely Elon Musk’s takeover at Tesla). Successful founding teams had strong pre-existing relationships. 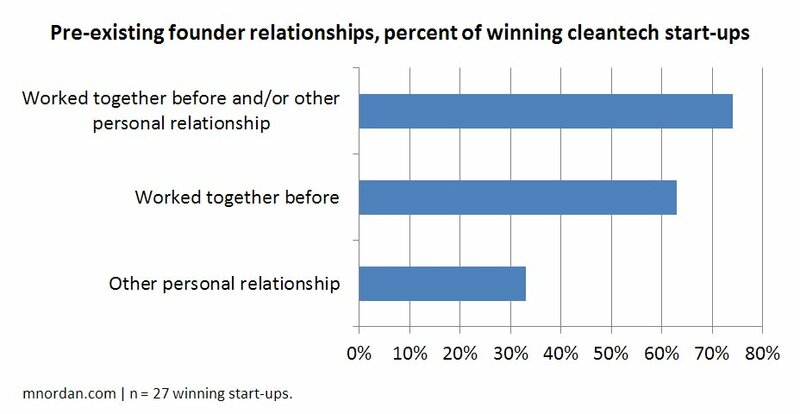 At 74% of successful companies, at least two of the founding team members had strong relationships before the company was formed – either from working together in past lives (e.g. the four Color Kinetics co-founders, who shared lab space at CMU) or knowing one another well outside of work (e.g. Solazyme’s CEO and CTO, who became close friends as freshmen at Emory). Winning start-ups included the accomplished core scientist who invented the technology as part of the founding team. Two-thirds of the winning companies exhibited this trait – think Frances Arnold at Gevo or Yet-Ming Chiang at A123Systems. 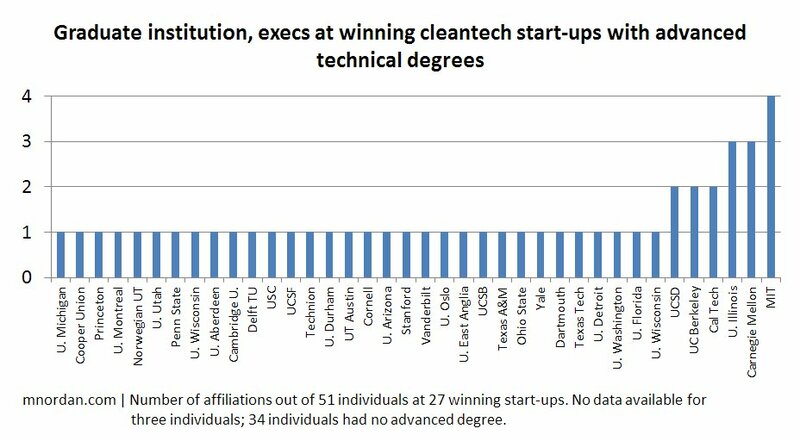 I frequently see start-ups out of universities where the key technologist declines to join the founding team, choosing to remain in academia instead and consult with the company at most; this behavior doesn’t seem to correlate with success. 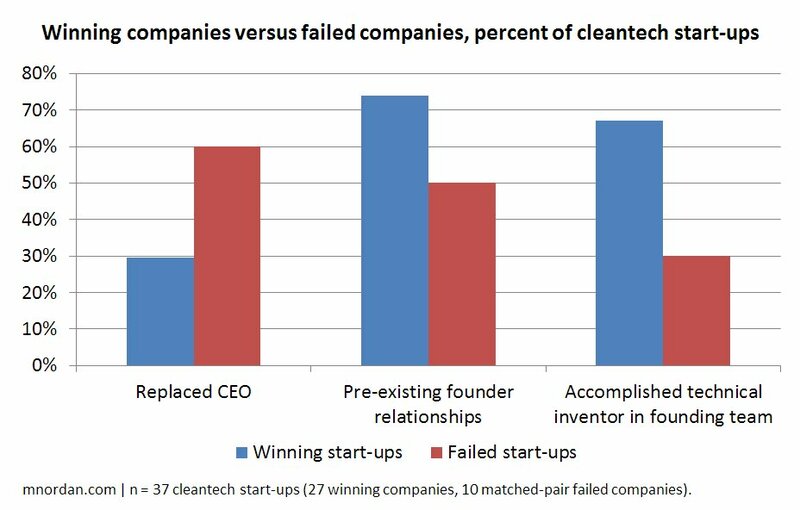 Six out of 10 failed companies replaced their CEOs along the way (versus three out of ten). Only half had strong pre-existing relationships (versus three out of four). Only three out of ten had the accomplished core scientist as part of the founding team (versus two out of three). The conclusion: Great founders hail from every age, background, and school. What differentiates winning teams is their relationships. Successful cleantech companies tend to be bands of brothers and sisters – including the core inventor – that come together on their own, form a complete team, and have a leader fit for the long haul. In contrast, here’s the recipe for a failure: Find an interesting technology, assemble a team of competent people around it who didn’t previously know one another, and don’t worry about bringing the original inventor along. I don’t want to present false absolutism here: There’s a great deal of subjectivity involved, the sample sizes are small, and the errors bars are wide. But these trends whacked me over the head hard enough that they changed the way I look at energy and environmental start-ups. It’s the team – and relationships make the team. 5 Responses to What Makes a Great Cleantech Team? Matt, Tell us more about your work with the Fletcher School. Great to see more research around innovation/technology coming out from the community. I was introduced to Josh by a gentleman from Fletcher’s career office who heard me speak at the Mass Conference on Clean Energy last year — and I’m glad this was so because his work was excellent! Matthew, it was interesting to see how your thinking evolved as you and Josh conducted this research from when the “obvious” data points (alma mater, age, experience, etc.) didn’t show anything conclusive to looking at more subtle elements like the relationships you discovered. It does seem intuitive – and your data supports it – that start-ups are like bands of brothers/sisters with bonds beyond a paycheck and a hopeful successful exit/liquidity event. I also wonder if the bonds of pre-existing work and personal relationships change the behavioral and organizational DNA of the successful organizations in your study. For example, if the success stories are formed by teams of people that have worked together in the past or were already friends, do those companies also exhibit flatter organizational structures vs. less successful companies that might have a more hierarchical org structure to satisfy the egos of the hired guns they are bringing in? Perhaps there are organizational commonalities (hierarchical vs. flat; top-down vs. collaborative) that might add even more heft to the conclusions you found. Then again, this line of inquire may be inconclusive or difficult to measure – and as you point out, there is the risk of trying to infer too much from too small a set of data, and the role of luck is obviously large. That said, I agree with your conclusion – what your research points to is an interesting set of new insights on what makes start-ups successful….or not!